Wisconsin politics: Joel Kleefisch withdraws child support bill. More political intrigue from America’s Dairyland. Daniel Bice, aside from Dave Umhoefer and Raquel Rutledge, may be the best watchdog reporter in Wisconsin (disclosure: I interned for their employer, the Milwaukee Journal Sentinel, in 2011). 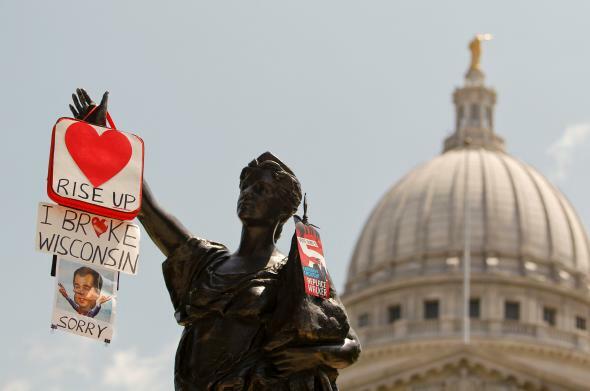 Bice’s No Quarter blog has been holding Wisconsin politicians’ feet to the fire for years, and as such he’s been accused of liberal hackery since Gov. Scott Walker was elected. But a recent story broken by the Wisconsin State Journal’s Dee Hall and reported by Bice is a pretty breathtaking display of crony politics. What happened: Wisconsin state Rep. Joel Kleefisch, who is married to Lt. Gov. Rebecca Kleefisch, sponsored a bill that was narrowly tailored to further the interests of a major campaign donor. The donor, Michael Eisenga, has given $3,500 to Joel Kleefisch, $7,500 to Rebecca Kleefisch, and $15,000 to Scott Walker through his company American Lending Solutions. In turn, Eisenga was given unmitigated access to quibble over the language of a child support bill introduced by Kleefisch, which would limit the income from which child support could be drawn at $150,000 a year. * Eisenga, a multimillionaire, had recently tried and failed to get a judge to lower the amount of child support he pays to his ex-wife for their three children. “It’s hard to fashion a general principle that will apply to only one situation,” Pam Kahler, a drafting lawyer with the Legislative Technology Services Bureau, wrote a Kleefisch aide on Sept. 13. The most remarkable thing about this whole story is the fact that all parties involved—even the attorneys!—did not stop to consider that their correspondence would be made public as soon as the bill was introduced. That either means Kleefisch was severely ignorant about Wisconsin’s sunshine laws (doubtful) or he thought no one would bother looking up the records. *Correction, Jan. 14, 2014: This post originally misstated that the Milwaukee Journal Sentinel broke the story on Saturday. The Wisconsin State Journal broke the story on Friday. This post also originally said the bill would cap child support payments at $150,000. The bill would have capped the income from which a percentage is drawn for child support at $150,000.